This events guide features all the information we have on events. The guide covers theatres featured on this website so you may wish to check local listings for any additional theatre tours available. Enjoy your event! Join us for our Theatre Tours with our in-house expert guide who’ll guide you through the theatre’s 252-year-old history – from the origin of its beautiful Georgian design, to tales of the myriad first-class actors who have trod our boards over the years. Explore the recent developments to our building: the new front of house foyer space, studio theatre, and our long-awaited heritage offer. Also enjoy the classic elements of the building that have kept this theatre running for over 250 years, such as: access to the historic auditorium, backstage areas, and for the first time as part of our tours, the Thunder Run. 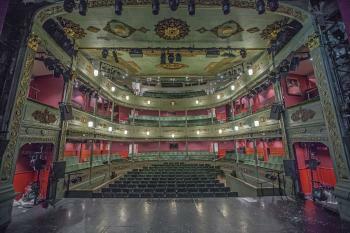 The perfect morning outing for anyone interested in theatre and Bristol Old Vic’s rich history. Tours generally start at 10:30am and last one hour. Tickets £12 (£10 concessions). Click here to go to the event website. Special Events information is provided on a best endeavors basis only. Information posted on this website was correct at the time of publication but details may have been modified after that date. You are therefore strongly encouraged to use the links provided for each event to confirm final details. This website is not responsible for any issues arising from incorrect information posted on these pages.